Hello to anyone who might still have this blog on their radar, I've a brand new blog up and running, point your browsers to A Fragment of Gondwana if you are interested. See! I can't even link to the new site. Update: OK, this message is now linked to my new site. See you on the other side! 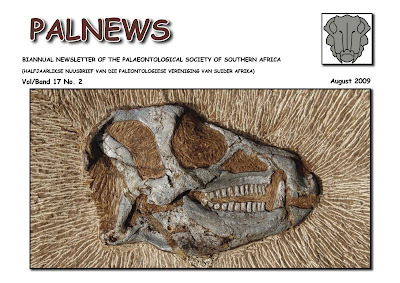 Have a look at the cover of the latest newsletter of the PSSA (Palaeontological Society of South Africa). This is one of two new skulls of Heterodontosaurus that Billy De Klerk has found in the Elliot Formation of South Africa. It seems Billy is O.K. with showing them off to the world before he publishes on them, so I don't think there should be any problem with me posting this picture here. Things to note: the premaxilla fails to contact the lacrimal (a lacrimal-premaxilla contact was one of the proposed characters linking Heterodontosauridae to Ornithopoda)and the angular (ventral edge of the lower jaw) has a Yinlong-like rugose boss. There is a complete postcranium to go with this skull - so we can expect even more information on these rather wierd, early ornithischians in the nearish future. 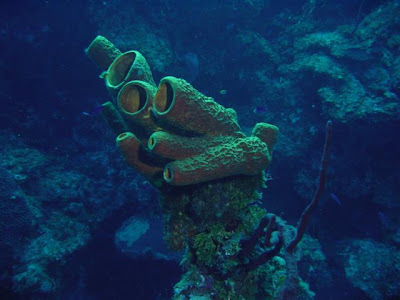 Although looking a little like plants, sponges (Phylum Porifera) are animals. Admittedly, they area very different kind of animal from the ones we see around us in everyday life. Unlike most others they lack bodies constructed from properly organized tissues, they are instead more like giant colonies of single cells. Indeed a famous experiment demonstrated that sponges that have been completely disaggregated into its constituent cells (by forcing them through a fine-mesh screen*) will begin to reconstitute themselves. Sponges lack any sort of gut, they instead live by sieving fine organic particles out of seawater. The food is absorbed directly by specialized ‘collar cells’ (more formally choanocytes) that line the canals and chambers that run through the sponges body. Sponges are also remarkable for their unique skeletons, which are generally made of tiny to microscopic spicules of silica or calcite or a lacy network of elastic organic material known as spongin (as in the original bath sponges). As you might expect with animals that lack a gut, nervous system or indeed organs of any sort, sponges are a very early branch of the animal tree. Indeed the tiny little disc of cells known as Trichoplax adhaerens may be the only living animal that branched away before sponges and all other animals split. Actually I’m oversimplifying here, because the evidence is looking good for sponge paraphyly. That means some of the different sponge groups are more closely related to tissue-grade animals (a clade called Eumetazoa) than to other sponges, so it wasn’t a single sponge-eumetazoan split. The remarkable conclusion that leads to is that we are directly descended from an animal that we would call a sponge. Given their early divergence and simple construction, one would expect sponges to have a venerable fossil record. Indeed they do, but not quite as long as one might expect. Sponge spicules seemed to appear in the fossil record at the beginning of the Cambrian Period along with a great number of eumetazoan groups (now dated to 542 million years). Some spicules have been reported from older strata but these are not without controversy. In contrast eumetazoans clearly had an older fossil record (e.g. the 545-565 million year old Ediacaran fauna). The mid 1990’s saw the publication of Palaeophragmodictya, the first probable whole body fossils of sponges from the Ediacaran fauna. 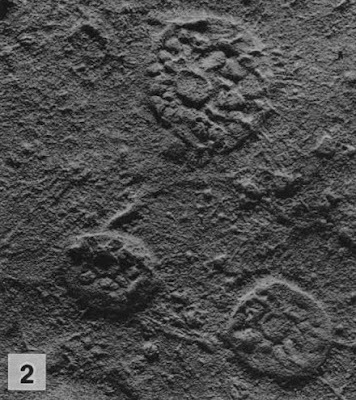 Nevertheless without spicular preservation (like other ediacaran macrofossils Palaeophragmodictya are preserved as impressions on the base of sandstone beds) there may always be some doubt as to its identity. 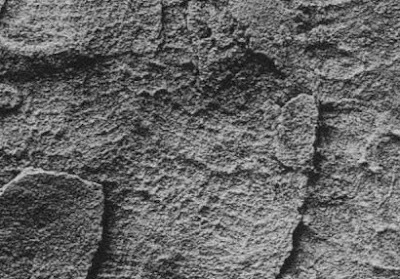 What remains unusual is that it took so long for such Ediacaran sponges to be found and that they remain a very rare component of Ediacaran faunas. Furthermore divergence dates calculated using molecular clock methods suggested a sponge- eumetazoan divergence of 650 million years. If the common ancestor was itself a sponge-grade organism we should expect the record of sponges and sponge-grade animals extending back to pre-Ediacaran times. This is well illustrated in the following diagram that teases apart the so-called ‘Cambrian explosion’(image from www.snowball.org). An interesting aspect of this molecular date is that it extends the range of animals back into a Period known as the Cryogenian, or just after it. What is special about the Cryogenian? It was period in Earth history lasting from 750-620 million years where the Earth went through several severe glaciations events known as ‘snowball earths’. Although the exact severity of the snowball-earth glaciations is a contentious topic, there is convincing evidence that the Earth was cold enough to support sea-level glaciers in the equatorial belt. So an important question is: had animal divergence begun in the Cryogenian as the molecular divergence dates suggest? That question has been conclusively answered this year in a Nature paper by Gordon Love and colleagues. Love et al. found convincing sponge fossils in sediments securely dated to the age of the Marinoan glaciation, the last snowball earth glaciations event of the Cryogenian. As a small aside the Marinoan is named after the seaside suburb of Marino, on the southern coast of Adelaide, my home town. My first ever geological field trip for my degree was looking at the Marinoan rocks of Marino. Anyway enough reminiscing, onto the Cryogenian sponges fossils. What were they? Spicules? Whole body impressions? No, Love et al. found molecular fossils, in particular 24-isopropylcholestanes. These particular hydrocarbons are, according to the authors, the degraded products of C30 sterols, a class of molecules only produced by members of the sponge class Demospongiae (here I have to accept the author’s word, I know far too little about organic chemistry to have any way of assessing the veracity of this statement). An interesting feature of snowball Earth Glaciations is that they are usually covered by a thin but continuous layer of carbonate rock: the 'cap carbonates'. These are thought to have precipitated out under extraordinarily hot conditions bought on by the retreat of the glaciers leaving behind an atmosphere dense in CO2 (which would accumulate while terrestrial weathering was essentially shut down underneath the ice-cover). Anyway these molecular sponge fossils are found in rocks below the cap carbonates, that is during the glacial period itself. The implications are pretty huge. It means that multicellar animals arose and first diversified in frigid seas largely covered by ice, and not during the flush of warmth that suffused the planet immediately after the glaciers lost their grip. Where could animals exist in such a sea? 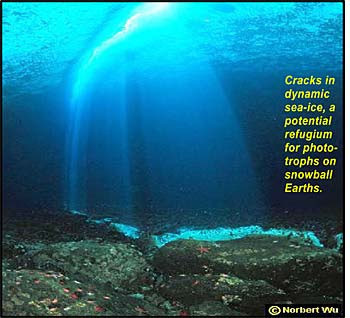 There were probably numerous little oases of light where cracks in the relatively thin equatorial sea ice would allow local blooms of bacteria and algae. These little patches may well have been the birthplace of multicellular animal life. A modern day equivalent of the oases that was the birthplace of animal life? Image from www.snowball.org. Gehling, J.G. and Rigby, J.K. (1996) Long Expected Sponges from the Neoproterozoic Ediacara Fauna of South Australia. Journal of Paleontology 70: 185-195.
once again the dreaded lurgy has struck our family this winter with Anwen needing a stay in hospital. So this post and the next few to follow were supposed to be posted a month ago. Teleost fish outnumber all other modern vertebrates two to one. Despite this staggering diversity it is accurate to call fish palaeontology the poor cousin of amniote palaeontology, particularly when it comes to grabbing publicity. Nevertheless with such a huge diversity it is not surprising that the clade has thrown up more than a few subgroups that do grab public attention. What is surprising is that the austral winter’s edition of Journal of Vertebrate Paleontology (volume 29, number 2) carries articles on no less than three of these attention grabbing teleost groups. 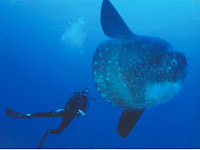 One is the giant ocean-going sunfish (Molidae). These giant jellyfish-suckers include the largest living bony fish but due to their poorly developed skeletons and pelagic habits have left a scrappy fossil record. Thus the finding of three articulated skeletons that exceed modern sunfish in size (one skeleton reaches 4 metres from fin tip to fin tip) is a big deal. Another curious fossil fish reported in this issue is a deep-sea anglerfish (Ceratoidea). 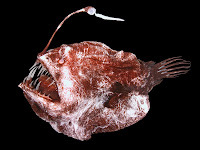 These bizarre fish are well known for their disproportionately large mouths lined with needle-like fangs and the ability attract prey with a luminescent lure. Finding a fossil of one of these is also quite unusual for the ceratoid clade is not all that old by geological standards. There simply aren’t that many places where such recent sediments have been laid down at great depth but have since been brought to a position above sea-level where someone might find any fossils that they might contain. Both of these discoveries are blogworthy finds, however it is the fossil piranha that I want to highlight in this post (Cione et al. 2009). Piranhas are, of course, the fabled freshwater fish of South America that are said to be able to skeletonise a cow in a matter of minutes when a school is whipped up into a feeding frenzy. The fossil piranha was found late Miocene (about 5 to 11 million years old) river sediments in northeastern Argentina. It has a concave dorsal margin of the premaxilla and tall, sharp triangular teeth that indicate that its affinities lie with the piranhas among the serrasalmids. Aptly named Megapiranha the fish is immediately striking for its great size. Known from a single jaw bone (the premaxilla) and some isolated teeth it is about two and a half times larger than the premaxilla of an average modern piranha. Assuming similar proportions to a modern piranha may have approached a meter in length. 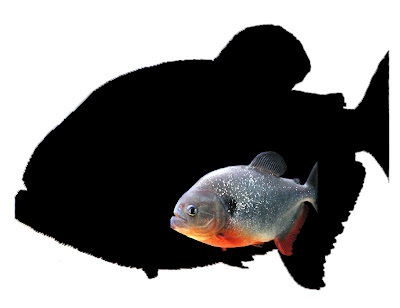 A modern piranha against a silhouette scaled up to fit the size of the Megapiranha premaxilla. Now the thought of a school of those getting into a feeding frenzy is worthy of any Hollywood B-grade creature feature. However it is far from certain that Megapiranha would have indulged in such hypercarnivorous behavior. It should be noted that piranhas form a clade of closely related species amongst a broader family of fish known as Serrasalmidae. Most serrasalmids (for example pacus) and even some piranhas are vegetarian, indicating that the herbivory is the ancestral diet of serrasalmids. Given the primitive position of Megapiranha (the sister group of all other known piranhas) it is quite likely that Megapiranha was at least partly vegetarian. What makes Megapiranha interesting, other than its size, is that it gives us some idea how the piranhas evolved their famous dentition. Primitive herbivorous serrasalmids have seven rounded, flat-topped teeth arranged in two rows. In contrast piranhas have a single row of six double-cusped, blade-like teeth. One would expect that the single rowed condition evolved from the double rowed condition by simple suppression of one of the rows, most likely the inner row which contains just two teeth. An alternative, proposed by Gosline (1951) is that the two rows integrated to become one. Megapiranha provides evidence that supports Gosline’s hypothesis, for it shows just a single tooth row but with the teeth placed in a staggered arrangement as if two rows were merging. 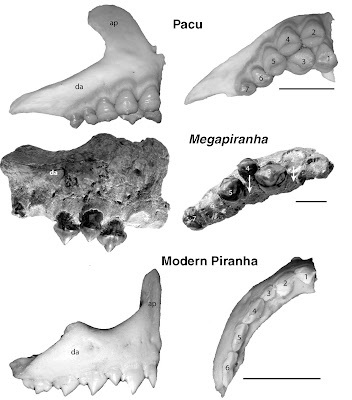 The premaxillae of a pacu (top), Megapiranha (middle), and a modern piranha (bottom)in lateral (left) and ventral (right) views. Scale bars equal 1 cm. Images from Cione et al. 2009. The teeth themselves are intermediate as well for although they bear tall, sharp-edged triangular cusps like modern piranhas, there is no secondary cusp and the bases are broad, perhaps supporting the idea that Megapiranha was not a hypercarnivore. It is a pity really, I find the idea of a giant ground sloth or an astrapothere being stripped to its bones by a school of meter-long piranhas somehow appealing. Cione, A.L., Dahdul, W.M., Lundberg, J.G. & Machado-Allison, A. (2009) Megapiranha paranensis, a new genus and species of Serrasalmidae (Characiformes, Teleostei) from the upper Miocene of Argentina. Journal of Vertebrate Paleontology 29: 350-358. Gosline, W. (1951) Notes on the Characid fishes of the subfamily Serrasalminae. Proceedings of the California Academy of Sciences 27: 17–64. Three new Australian dinosaurs, Australovenator wintonensis at the top, Wintonotitan wattsi in the middle and Diamantinasaurus matildae below. Scale bar equals 1 metre. From Hocknull et al. 2009. What a year for dinosaur research it has been. We’ve had: the publication of a Cretaceous heterodontosaurid with filamentous integument; a slew of new taxa including a member of the perennially popular tyrannosauroids; a toothless, herbivorous ceratosaur !!! with a bizarre hand (which may or may not shed light on the homology of bird fingers). Now that dinosaur depauperate continent , Australia, that produced naught but a handful of decent dinosaur fossils in all the years I lived there, has thrown up three new taxa. The open access paper is here. Aussie geo-folklore would lay the blame on its apparent dinosaurlessness on the geological quiescence Australia has experienced since the Mesozoic. With no major mountain building events to thrust up strata of the right age there is very little exposure to search and much of that has just been sitting around since it was deposited getting ever more deeply weathered. While much of this is true it does not preclude the preservation and excavation of decent dinosaur fossils as this new paper shows. The fossils come from the cattle country of central Queensland. Where the land is as flat as a tack, and almost completely grassed over. Not exactly promising territory for palaeontological exploration. Nevertheless the area is unlerlain by the Winton Formation an sedimentary unit laid down on a floodplain fringing a great epicontinental (‘inland’) sea during the middle part of the Creataceous Period. So why not dig down to the sediments? That is exactly what the team reporting (Hocknull et al.) these new dinosaurs has done. According to the pHocknull et al. the subcrop of the Winton Formation lay under just 1 m of overlying soil. We’ve cut through thicker piles of overburden in our Elliot Formation, so it is not that the Winton Formation is out of reach. Of course, on such flat soil covered land you are lacking the usual clues like fragments of weathered bone falling downslope to lead you to productive sites, nonetheless chunks of weathered bone in the soil can signal something worthwhile lies below. Furthermore the excellent state of preservation of some of these bones (particularly those of the theropod, Australovenator) show that deep weathering profiles may not be quite the problem they’ve been made out to be. So what did Hocknull et al. find? Two new sauropods (Wintonotitan wattsi and Diamantinasaurus matildae, both titanosauriforms, and an allosaurid theropod (Australovenator wintonensis). Actually to say that two new sauropods were found is not strictly accurate. The holotype specimen of Wintonotitan had been found decades earlier, described as Austrosaurus sp. (Coombs and Molnar 1981) and even incorporated into a phylogenetic analysis of sauropod relationships (as Austrosaurus, Upchurch et al 2004). The type of Austrosaurus is just a series of beat-up dorsal vertebrae, consisting mostly of the centra alone. It comes from the slightly older Allaru Mudstone and differs slightly from the dorsal vertebra of Wintonotitan, indicating that the two are not synonyms. In anycase the name Austrosaurus is best dropped as a nomen dubium based on inadequate remains. A couple of rather preliminary phylogenetic analysis suggest that both sauropods are somphospondyls (titanosauriforms more closely related to ‘classic’ titanosaurs (exemplified by the armoured Saltasaurus from Argentina) than to Brachiosaurus. This is an unsurprising result as almost all sauropods of this age belong to this group. Wintonotitan was found to be a relatively basal member of the group, outside the Titanosauria proper but certain features such as the plate-like ischium with elongate iliac peduncle, medially shifted deltopectoral crest on the humerus and the eye-shaped pleurocoels in the dorsal vertebrae indicate that Wintonotitan may actually hold more derived position within Titanosauria, like its compatriot Diamantinasaurus. Anyway it is the carnivore, Australovenator that I want to discuss for the rest of this post. As Hocknull et al. point out the non-avian theropod record from Australia is abysmal so there is little to compare it too. 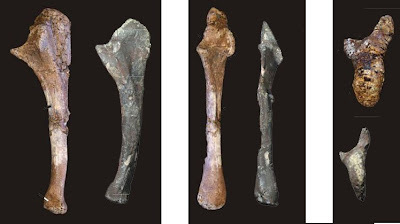 One recently described Australian theropod is NMV P186076, an isolated ulna from the Cretaceous of Dinosaur Cove, Victoria that Smith et al. (2008) found to be closely related to the large tetanuran Megaraptor from Argentina. While Hocknull et al. point out some differences between the ulna of Australovenator and NMV P186076 they don’t make much of the strong similarities that these ulnae display in comparison with other basal tetanuran theropods. These similarities include an hypertrophied, mediolaterally compressed olecranon process and an enlarged, proxiodistally elongated lateral tuberosity, defining a cranial fossa. You can see the similarity in the composite figure I whipped up below. Ulnae of Australovenator and cf. Megaraptor from Dinosaur Cove. Lateral view on left anterior vie in the middle and proximal (top) view on the right. The larger pale brown bone is Australovenator the smaller dark grey bone is cf. Megaraptor. A ‘megaraptorid’ identification for Australovenator also gels with its rather large wicked looking thumb claw that is about three times longer than its proximal height. More interesting is the astragalus (main ankle bone) of Australovenator which bears a striking resemblance to another isolated Victorian bone, this time from the Cretaceous deposits near Inverloch, which has been touted as everything from Allosaurus to an abelisaurid. Thus despite the small time gap between the two isolated Victorian theropod bones it is quite possible they came from closely related animals. That three separate occurrences from the middle of the Cretaceous of Australia seem referable to this clade indicates to me that these ‘megaraptorids’ were the dominant large carnivores in the middle Cretaceous of Australia. ‘Megaraptorids’ (if indeed they are a clade) are still rather fragmentarily represented, so the addition of Australovenator is most welcome. It helps pull in some other poorly known theropods into this newly recognized fold. One of these is Fukuiraptor kitadanensis a small possible allosauroid from Japan, that has an astragalus that closely resembles the astragalus from Inverloch and that of Australovenator. Although damaged the ulna also appears to bear an unusually large mediolaterally compressed olecranon process. Chilantaisaurus tashuikouensis is a second possible ‘megaraptorid’ from the Cretaceous of Asia. Last year when Smith et al. published the Dinosaur Cove ulna I suggested that this giant asian theropod was a megaraptorid based on: 1, the enlarged manual ungual 2, an apparent close relationship to spinosaurids found by Rauhut (2003)and 3, a similar position for ‘megaraptorids’ found by Smith et al. (2008). Although the spinosauroid position for ‘megaraptorids’ is looking weaker than their position as a basal radiation of carcharodontosaurid allosauroids, I still think there may be a possibility that Chilantaisaurus is a megaraptorid. Supporting this is the presence of a distal craniomedial ridge of the tibia in Australovenator much like the ridge seen in Chilantaisaurus (admittedly this ridge is also found in Suchomimus and Coelurus, so it is not unique to ‘megaraptorids’). Adding a little strength to this idea is the rather hatchet-like deltopectoral crest of Fukuiraptor which looks like a partially developed version of the strongly hatchet-shaped deltopectoral crest of Chilantaisaurus. In conclusion the ‘megaraptorids’ might be a cosmopolitan clade of Cretaceous allosauroids that share a hatchet-shaped deltopectoral crest, an unusual ulna morphology with an enlarged, blade-shaped olecranon process, an enlarged thumb claw, a femoral head that is not as strongly elevated as other known carcharodontosaurids, a medial ridge on the distal tibia and a distinctive astragalus with a square shaped ascending process. If this clade really exists we can expect earlier representatives to extend back into the Jurassic to allow them to have achieved their near cosmospolitan distribution. Time, new fossils and further analysis may tell. Coombs WP Jr., Molnar RE (1981) Sauropoda (Reptilia, Saurischia) from the Cretaceous of Queensland. Memoirs of the Queensland Museum 20: 351-373. Rauhut OWM (2003) The interrelationships and evolution of basal theropod dinosaurs. Special Papers in Palaeontology 69: 1-213. 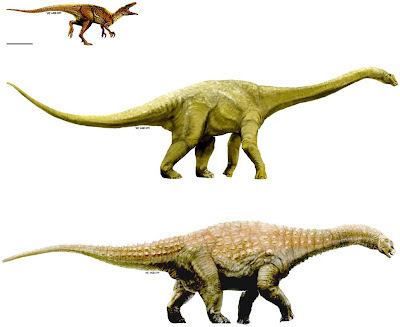 Upchurch P, Barrett PM and Dodson P (2004) Sauropoda.Pp. 259-322. In Weishampel DB, Dodson P and Osmolska H (eds) The Dinosauria. Second Edition.University of California Press: Berkeley. No time for an in depth post today, so I'm keeping the squamate theme going with a picture from my archives. This is a legless skink (Acontias gracilicauda)that happened to have made it home directly above an early Jurassic sauropod bone bed. So it had to be relocated. There is a moderate diversity of acontine skinks in southern Africa: they are just one of many lizard lineages, apart from snakes, that have beome completely limbless.